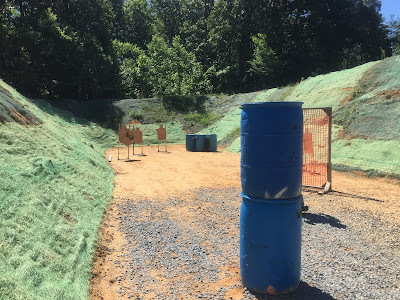 I got to spend part of this Independence weekend shooting a fun IDPA match, though it was somewhat ironic to be doing it in the less-than-free state of Maryland. This was the first time I attended the monthly match at the Sanner's Lake Sportsmen's Club in Lexington Park, MD. I was a little concerned about the two hour drive and early morning alarm clock setting, but as it turned out, the day was more than worth those minor inconveniences. Excepting the early morning sun that stayed in my eyes most of the trip, the drive was scenic and I arrived with time to spare. The match consisted of six stages, requiring about 90 rounds to complete. That's a relatively high round count for most local matches I attend, so that was a bonus and made the drive time even more worthwhile. 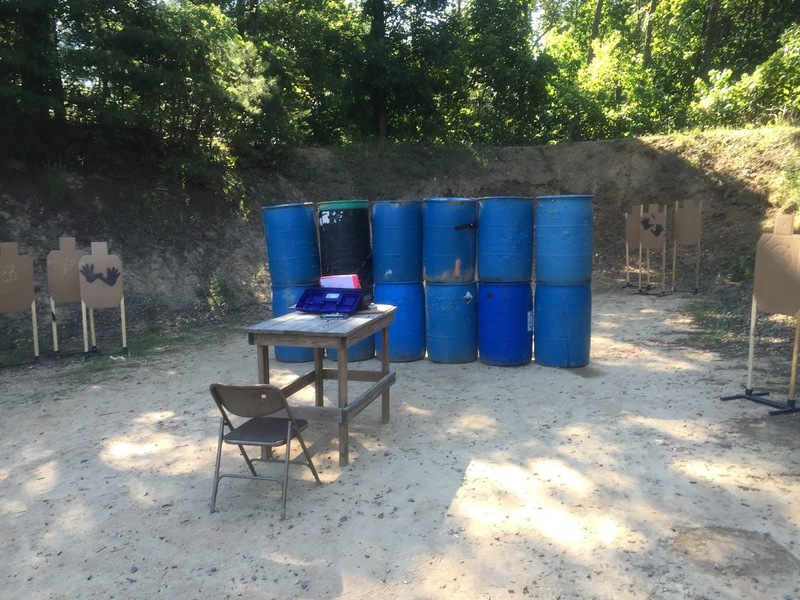 The first stage our squad shot started with the loaded gun in an IDPA box on a table, along with the magazines. Beginning the stage with a short run to the table to retrieve the gun, we then engaged six targets in tactical sequence. The placement of the targets behind non-threats and in small ports in a wall pretty much made head shots a requirement. Finishing the stage -0 was a great way to start the match. The next scenario started seated at a table, with the unloaded gun and all needed mags on the table. Loading the gun, we engaged targets on either side while seated. The grabbing a magazine — most folks did a tactical reload here — we moved to engage five targets that were behind a wall of barrels. Next up was a "standards" stage with three targets at seven yards. All the targets had parts of the bodies and heads painted as hard cover. A total, and limit, of eighteen shots was required; two on each target freestyle, then strong hand only, then support hand only, all in a single string. At least two head shots were required on each target. I felt I dropped too many points on the stage, but still finished well. Following that challenge, we moved to a stage shot entirely on the move. There were three open targets downrange beyond three barrels arranged in a triangle about 7 yards apart. We were allowed three magazines loaded to six rounds each. Two shots were put on each target, while moving around the barrels in three directions; across, forward, then backing up, with a reload at each direction change. The fifth stage shot had us starting behind a barrel, then engaging three target while advancing to a wall. At the wall there were three more targets engaged from cover. Then we made a fast spring to find the final two targets hidden low behind a row of barrels. It was a fast, fun stage and I finished down just 2 points. The last stage simulated shooting over the hood and through the window of a car, with six fairly open targets, though with at least one head shot forced by hard cover. Some low shots found me -5 for the stage. There was a lot of variety found in the courses of fire. (Photos of all the stages can be found here.) There were head shots, close and far targets, shooting on the move at both open and partial targets, loaded and unloaded starts, as well as holstered and table starts. It was quite an enjoyable match, and an awesome start to the holiday weekend. I was very pleased with how I shot, placing very well in the division, classification and overall stats. As always, there was a thing or two to improve on, but if there wasn't, what would be the point? Since it was a new venue for me, I didn't know anyone on my squad (nor I believe, anyone at the match) but the folks were all friendly and a very enjoyable time was had. The well-organized match moved smoothly and quickly. We started shooting around 9:00 AM and were finished by 11:30. As suspected, the drive home took longer than the morning drive. A combination of accidents and holiday traffic added about 30 minutes to the drive. Despite the drive time, I am glad I made the decision to make the trip. I'm looking forward to getting to another Sanner's Lake IDPA match soon.